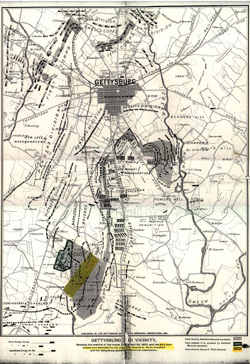 The 1885 version of the GBMA map marks the first significant divergence in appearance from the 1883 edition. Probably in an effort to broaden the appeal of the map as well as to draw attention to the first day's field, it was decided to include the troop positions for the July 1st engagement on the map. 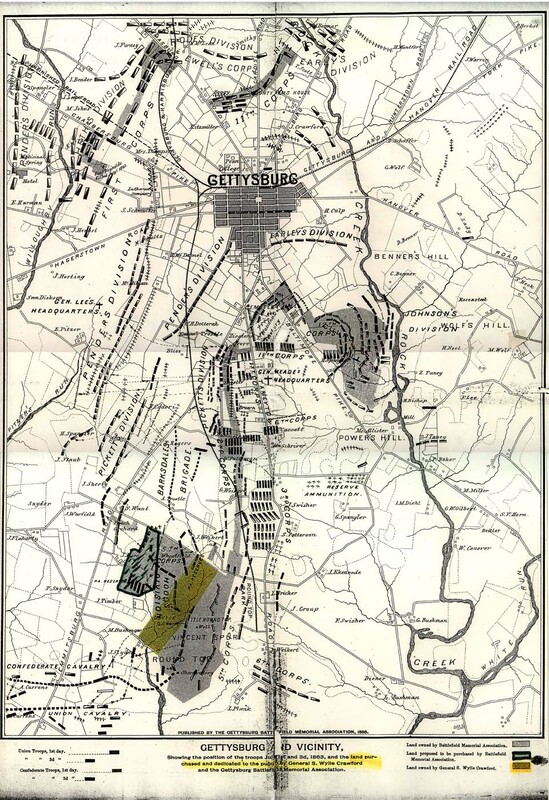 Noteworthy gains were made by the Association in the acquisition of land defining the lines of both the Union 1st and 11th Corps on the first day's field. Resolutions were passed to build avenues along this new territory so as to provide access to the battlegrounds for visitors and for monument building. The delineation of troop positions on the map for two very different days of battle gives a cluttered and confusing appearance compared to the 1883 edition. This disheveled look must have been noted early on. As quickly as August of 1885 plans were afoot to revise the map yet again.